Big cats are something magnificent. They're fierce and savage killing machines, capable of meticulously stalking prey before tearing it to shreds. In Man-Eaters #1 from Image Comics that savageness is paired with a long simmering resentment of societal norms. The issue is written by Chelsea Cain, illustrated by Kate Niemczyk, colored by Rachel Rosenberg and lettered by Joe Carmagna. A mutation in Toxoplasmosis causes menstruating women to turn into ferocious killer wildcats—easily provoked and extremely dangerous. As panic spreads and paranoia takes root, the fate of the world rides on the shoulders of one twelve-year-old girl. Cain's script certainly isn't subtle and that's something that works exceptionally well in the issue. The tone of the script is both biting and emotional, primarily as Cain channels the fury of big cats into women in a way that's a harsh--yet appropriate--condemnation of our society today. Women have always been forced to fit into certain boxes in terms of what's "right" for their lives and it's generally been others (read: mean) telling them what those boxes are. That's what makes Cain's narrative so exhilarating and refreshing in that it completely stomps on the supposed societal norms and the sarcasm of the book's approach is pervasive. And themes aside, there's definitely enough of a story here to keep the series moving in a way where the characters will require some emotional investment on the part of the reader. An very clean and concise approach is taken by Niemczyk when it comes to the artwork and it works very well. Niemczyk doesn't feel compelled to obey any pre-ordained standards in that she allows each page to feel free-flowing and accessible. This is best seen on pages where Niemczyk eschews traditional panels in a way that still affords the reader a clean presentation that's easy to follow; for instance, there's a lovely two-page spread that's a zoomed-out look at an apartment complex that has multiple layers of action occurring simultaneously that's not broken up by panels. And Niemczyk clearly has a good grasp on what the book sets out to accomplish as her artwork is very insightful in its approach. Rosenberg's colors are largely on the red/pink side of things and do a great job of making the book feel more realistic. 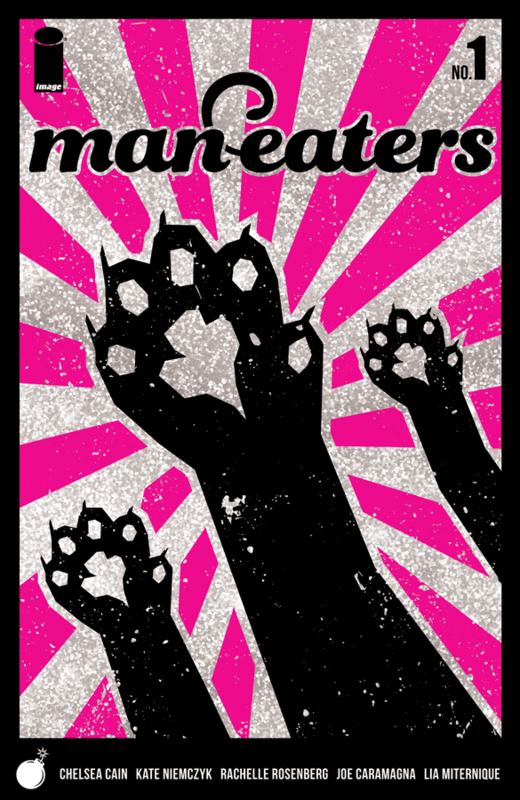 Man-Eaters #1 is a book steeped in feminism and a primal sense of rebellion. Maude is one of the main characters, but there's so much more to the story than just a traditional protagonist facing a challenge. Cain pens a script saturated with social commentary that's a little suffocating because of its density, but the exposition is necessary for properly framing Maude's impending struggles. There's clearly a method to Niemczyk's artistic madness and every page feels extraordinarily nuanced in what it includes and uses to bolster the story. Man-Eaters #1 should be read across the board, if for nothing else to offer a window into a simmering anger that pervades society throughout the world. Man-Eaters #1 is available now.